You Can Buy BioShock Infinite's Vigor, But It'll Cost You. A Lot. Not that it works. You wouldn't be reading about that kind of breakthrough on a mostly-video-games website. 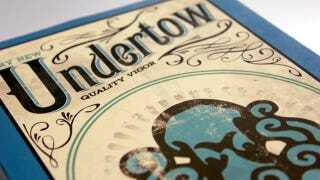 But the bottles of Undertow Vigor being sold on Irrational's site sure look nice, and more importantly, authentic. Only 500 have been made, each standing 10" tall and with some amazing detail on both the bottle and the box it comes in (which was designed by Irrational's in-house superstar Zoe Brookes). Looks amazing! But there are two downsides. First, it costs $350 (or $600 for a bottle signed by Ken Levine). Second, seems you can't remove the tentacle from the top of the bottle, meaning if you want to actually use this as a bottle, you're going to need to be careful. You can also get a bottle of Devil's Kiss, if that's more your style.